It’s always nice to find a kindred spirit — someone who knows what you know and likes what you like. The problem today is that kindred spirit whom you think is your friend might well be your worst enemy. One of the most effective tools attackers use to breach everything from high-security networks and physical installations to your most closely held secrets is social engineering. This webinar looks at how social engineering works, why it works as well as it does, how to identify an attack and what to do if you think you’ve been compromised. Everyone knows that multi-factor authentication (MFA) is more secure than a simple login name and password, but too many people think that MFA is a perfect, unhackable solution. It isn't! Join Roger A. Grimes, KnowBe4's Data-Driven Defense Evangelist, and security expert with over 30-years experience, for this webinar where he will explore 12 ways hackers can and do get around your favorite MFA solution. The webinar includes a (pre-filmed) hacking demo by KnowBe4's Chief Hacking Officer Kevin Mitnick, and real-life successful examples of every attack type. It will end by telling you how to better defend your MFA solution so that you get maximum benefit and security. Looking at the current cyber attacks it's clear that ransomware, phishing, CEO Fraud / W-2 scams are on the rise costing organizations billions of dollars in 2018 alone. It got us thinking what security measures are actually effective with this ever-changing threat landscape? Are technological defenses enough? Is it really necessary or feasible for you to train and test users to the point of becoming a human firewall? Is a human firewall even helpful if antivirus, firewalls, email security, etc. are already in place? Join our team of experts as we discuss the advantages and disadvantages of a technology-only approach and whether end users can actually be trained to the point of reducing organizational risk. Learn the facts, so you can decide how best to invest your time and money to make sure your organization gets the best bang out of your security budget buck. It’s common knowledge that humans are the leading cause of IT security incidents. Whether accidental or intentional, a human-centric root cause lies at the center of literally every security incident. You can’t just eliminate all the humans, so security professionals are left to find reasonable measures to ensure that the human element of their organizations can act as a bulwark of security rather than as a catalyst for disaster. This is easier said than done and requires constant vigilance. Human security is not a “one and done” effort. It’s an ongoing process often including automated security awareness training and simulated phishing. How do you make it happen? What steps can you take to get there? What are the real problems that need to be solved? Most importantly, do your employees really understand their critical role in protecting your organization? That got us thinking… what if we whip out our magnifying glasses, pull out the trench coats and use our research skills to differentiate fact from fiction? That's exactly what we did for this interactive webinar where we dug deep to help you decide how to invest your time and money wisely, how to implement worthwhile defenses, and what holes to plug so your organization gets the best bang for your security budget buck. Listen in as Roger Grimes, KnowBe4’s Data-Driven Defense Evangelist, and Erich Kron, KnowBe4’s Security Awareness Advocate, uncover the truth behind the Top 5 IT Security Myths. They’re stating facts and slinging stats. Then the audience decides whether each myth is confirmed or BUSTED! Many of the world's most reputable organizations rely on Kevin Mitnick, the World's Most Famous Hacker and KnowBe4's Chief Hacking Officer, to uncover their most dangerous security flaws. Kevin’s experience as a security consultant and his vast knowledge of social engineering are part of what help you train your users to stay a step ahead of the bad guys. Wouldn’t it be great if you had insight into the latest threats and could find out “What would Kevin do”? Now you can! It’s all out there in the open — essentially the ways and means for bad actors to attack your company. There’s even a label for it: Open Source Intelligence. This is the underlying data that will help attackers create convincing attack emails with personal information and details about a target’s life so detailed that the attack appears to come from your best friend. This 20/20 webcast looks at how attackers use details about you either to attack you or to attacker others and make them think it’s from you — and what you can do about it. No matter how much security technology we purchase, we still face a fundamental security problem: people. This webinar will explore the different levers that social engineers and scam artists pull to make us more likely to do their bidding. Join Erich Kron, Security Awareness Advocate for KnowBe4, as he provides fun and engaging examples of mental manipulation in everyday life: from the tactics used by oily car dealers, to sophisticated social engineering and online scams. Additionally, We'll look at how to ethically use the very same levers when educating our users. This is the true story of an IT Manager who was tired of his users clicking on everything and wanted to teach them a lesson… in a good way. Find out what happens, when you stop being polite and start getting real. New-school Security Awareness Training! In this "From the Trenches" event, we’ll talk with Tory Dombrowski, IT Manager at Takeform and KnowBe4 customer, about his experiences and lessons learned while designing and delivering a security awareness training plan for his users. Erich Kron, KnowBe4's Security Awareness Advocate, and Tory will dive deep to share best practices and creative ideas, so you know what to expect when executing your own program. Why it's so important to empower your users to become a "human firewall"
If all you were worried about were phishing attempts, think again! 2019 promises to be the biggest year yet when it comes to not only the sheer volume of cyberthreats but also the new ways your users may be targeted. How prepared are YOUR users in standing up to them? On this episode of On the Air, we’ll talk about the top threats your users will be facing in 2019 and the training and testing you’ll need to deliver to make sure they’re ready for them. We’ll be talking with IT pros from the Spiceworks Community as well as an expert from KnowBe4. Passwords have been with us for some 50 years now and still is used for a variety of mission-critical and highly classified projects and devices. That said, there is a case to be made that the password is obsolete and should simply be eliminated. This webcast looks at how we got here and where we’re headed with passwords – if anywhere at all. - Things to look out for specifically this time of year w/the holidays, tax season, W2 fraud, end of year, etc. Watch for an information packed session with research and analysis you can’t get anywhere else on this topic! What really makes a “strong” password? And why are your end-users tortured with them in the first place? How do hackers crack your passwords with ease? And what can/should you do about your authentication methods? In this unique webinar, you will learn about the recent NIST controversy and related password cracking problems. The “combatants” will be on the one side KnowBe4's Chief Hacking Officer, Kevin Mitnick with decades of first-hand “red-side” penetration testing experience, and on the other side, Roger Grimes, KnowBe4's Data-Driven Defense Evangelist with decades of experience on the blue team. The referee will be Perry Carpenter, KnowBe4's Chief Evangelist and Strategy Officer. They will provide an in-the-trenches view of authentication hacking, so that you get some insights about the truth of the effectiveness of passwords, various password management guidelines, and even stronger authentication systems using multiple factors. This is the true story of two IT pros who got sick of their users clicking on everything and wanted to teach them a lesson… in a good way. Find out what happens, when people stop being polite, and start getting real. The Real World: Security Awareness Training! In this webinar we talk to two IT pros from the Spiceworks Community about their experiences and lessons learned in designing and delivering a security awareness training plan to their users. So many of today’s cyberattacks are based on tried and true methods of social engineering, many dating back as much as 30 years. But attacking a victim’s machine for the sole purpose of mining cryptocurrency, installing ransomware or otherwise monetizing your network really is a 21st Century breach. The problems, of course, are still the same: loss of productivity, potential data loss, and quite frankly, who wants a criminal mucking around in your network? This webcast looks at how companies can train their staffs — and senior management — to recognize a potential phishing, visihing, smishing or other attacks, as well as techniques security teams can use to test their staffs on how well they understand the training they’ve received. While hackers and cyber attackers are continually developing more sophisticated methods for penetrating enterprise systems, most of their exploits begin with a simple step: fooling users into breaking security policy. These "social engineering" attacks – including phishing, social networking scams, and online "watering holes" – are designed to trick your users into giving up their passwords or opening email attachments that contain malware. But how can enterprises prevent this sort of attack? Can users be trained to recognize such exploits and avoid them? In this webcast, experts discuss the most effective methods of defending against social engineering attacks. Cryptomining infections are growing exponentially this year. Bad guys are hijacking your network processing power to steal your workstation and server resources. They are using various families of malware trying to stay under your radar. Trying to maximize their criminal profits, they now infiltrate your network and use malicious code to determine the most lucrative attack–cryptomining or ransomware–making these attacks more dangerous than ever. To add insult to injury, they often leave whole libraries of hacking tools and backdoors behind. Join Erich Kron, KnowBe4's Security Awareness Advocate, and learn more about the combined Ransomware / Cryptomining threat along with real-world examples of how criminals attack your users and network through innovative and devious tactics. KnowBe4's Chief Hacking Officer, Kevin Mitnick, shows a two-factor authentication exploit based on a credentials phishing attack using a typo-squatting domain. Once the user falls for this social engineering tactic and enters their credentials, the 2FA token gets intercepted and it's trivial to hack into the LinkedIn account. Quantum computing is a game-changer and will have a huge impact on the way we do business, safeguard data, explore space, and even predict weather events. Yet, some experts say in the not so distant future quantum computers will break existing public key cryptography forever. The bad guys will be able to use more secrets against you than ever before, especially in increasingly sophisticated spear-phishing attacks. Attend this exclusive event to learn what you can do to prepare. The quantum computing break is coming. Will you be ready? The bad guys are getting very creative, impersonating an executive in your organization and asking for financial reports or they ask employees in payroll to make changes to bank accounts. According to the FBI, their efforts have earned them an estimated $12 billion through Business Email Compromise also know as CEO fraud scams. And to make things worse, these attackers can be working on multiple potential victims at the same time. Invoice fraud, escrow redirection, payroll fraud, and simple wire transfer fraud are all tools in the attacker's arsenal. Defending against these types of phishing attacks is possible by layering technical and non-technical controls. Watch this on-demand webinar, as we take an in-depth look at how the latest attacks work and the psychology and mechanics behind them. We also discuss defensive measures you can take now to defend your organization against these attacks. KnowBe4 is the world’s most popular integrated Security Awareness Training and Simulated Phishing platform. Realizing that the human element of security was being seriously neglected, KnowBe4 was created to help organizations manage the problem of social engineering, spear phishing, and ransomware attacks, through a comprehensive new-school awareness training approach. 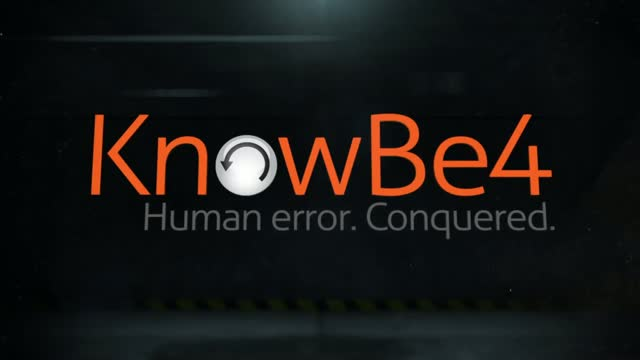 KnowBe4 trains employees to make smarter security decisions.